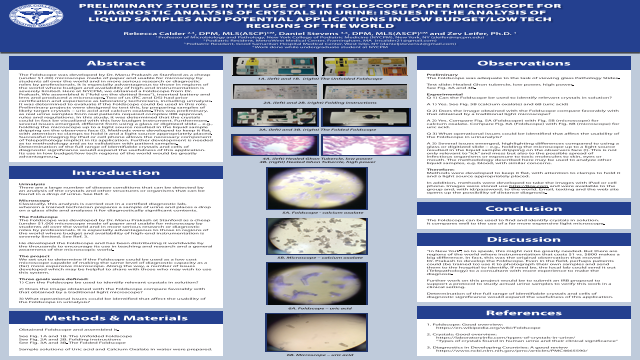 ePosters - Preliminary Studies in the Use of the Foldscope Paper Microscope for Diagnostic Analysis of Crystals in Urine: Issues in the Analysis of Liquid Samples and Potential Applications in Low Budget/Low Tech Regions of the World”. Poster Title: Preliminary Studies in the Use of the Foldscope Paper Microscope for Diagnostic Analysis of Crystals in Urine: Issues in the Analysis of Liquid Samples and Potential Applications in Low Budget/Low Tech Regions of the World”. Author(s): Calder, R., Stevens, D. and Leifer, Z.